2016- NEW GRANDBABY AND ANNIVERSARIES! Posted February 28th, 2016 by Liz & Doc & filed under News. 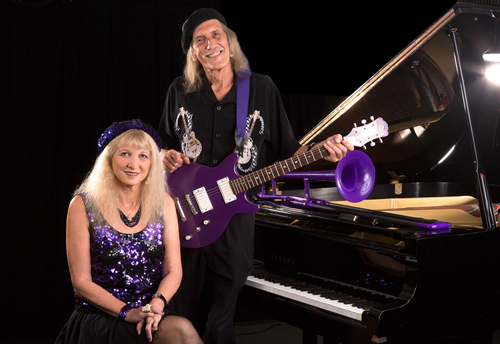 We’re gearing up for the 7th Annual Boogie Woogie/Blues Piano Stomp in St. Pete March 5th. Bob Seeley & Daryl Davis return by popular demand, plus Luca Sestak from Germany. See our SHOWS Page for ticket info. Jan. 6, 2016 we welcomed grandbaby #3, Greyson Cash! Congrats to Kristen & Drew, and to Greyson’s siblings Jackson & Julie, who are now three years old. 20 years ago in January, we drove our motorhome through ice & snow to make the big move from Ohio to Florida and finally bought a home here 11 months later in Nov., 1996. Our first Florida show that year was at Skipper’s Smokehouse in Tampa, opening for Saffire: The Uppity Blues Women, where it was a freezing 28 degrees-brrrr! That June we played Chicago Blues Festival with Diamond Teeth Mary, then released our best-selling CD Six Fingers Boogie & toured the Midwest for nine weeks in the RV. What a year! 30 years ago in 1986, we founded our independent label Upright Records & now have six releases plus a new one in the works. 40 years ago in 1976, Liz officially became a professional musician with her first paid gig. Subscribe/buy the Feb./March Big City Blues Magazine! It’s a piano issue, featuring many of our friends, plus Liz’s 1st article/byline! California here we come! Liz is playing The Queens of Boogie Woogie in May- see SHOWS page for dates & info. Congrats & thanks to all Frequent Fans of 2015: 1.Dan H. attended 40 shows! 2. Judy R., 3. Diann F. (30 shows!) 4. Teresa W., 5. Priscilla H., 6. Linda M., 7. Wayne K. (2o shows! ), 8. Art O., 9. Ralph N., 10. Hildegarde, 11. Barry S., 12. Jerri E., 13. Larry I., 14. Barry H. (10 shows each.) Get your free card at any show. 2-26-16 RIP John Hursey, Liz’s 2nd cousin & owner of The Canal House in Tuscarawas, Ohio. John was a great, funny guy & true music/blues supporter & we loved playing there every summer for the past 11 years.